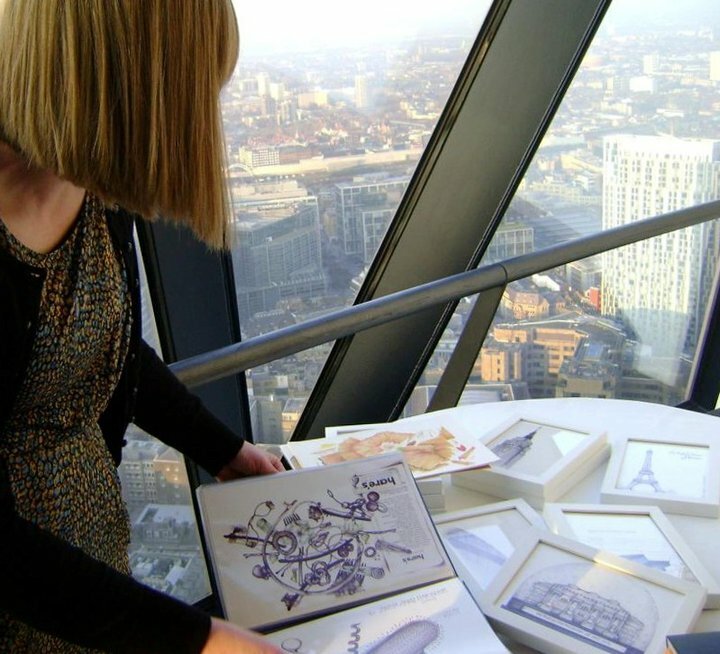 Okay, so after years of people asking, I've finally made a little film of me drawing. I say 'I've' made a film but that's not strictly true. Here's a film that my friend, with the technology and know-how, made of me drawing. I'd found this old half finished drawing, hanging around the house, so thought I'd complete that for the film. It was filmed over half a day - so, you can imagine how long we'd have been filming if I'd completed the whole thing. Too long. Can't think of much else to say. I've just received the film in my inbox and am excited to post it. Please ask if there's anything you'd like to know. Oh and a big huge thanks to Tim for making this and for everything else he does. Recently I've been organising the scans of all of the drawings I've made over the past few years and put them into folders and onto memory sticks etc. It's amazing the things you find to do when you have no internet. I came across a bunch of drawings that I did for a job a few years back. It was for the launch of a new Cross pen (yes, THAT Cross pens). It was a great job. I was approached by Cross to make a series of drawings and to attend their launch night, at the top of the Gherkin (yes, THAT Gherkin). I had to draw a series of iconic buildings and I drew them in the only way I knew how - back then - in the form of souvenirs. I remember it was a real quick turn around job and that I went right down to the wire with the deadline. Hell, I was still drawing them on the train down to London! So, unfortunately I didn't get to scan all the drawings. I'm particularly annoyed that I didn't scan the New York Museum of Modern Art in a snow globe. Still, it was one of those gigs that was a joy to do (and, let's be honest, it's not often you get to say that). Plus I got to watch the sunset at the top of the Gherkin and to see all the lights go on over London town. Here's a brand new drawing. 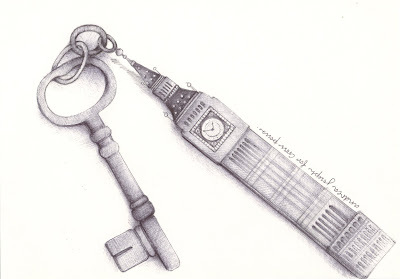 It was never really actually meant to be a drawing, if you know what I mean? No? 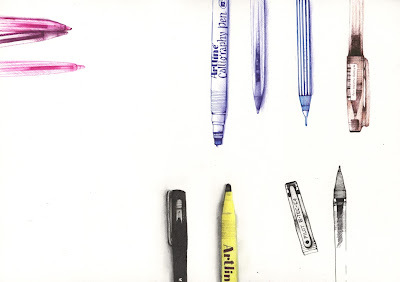 They were just individual drawings of individual pens. 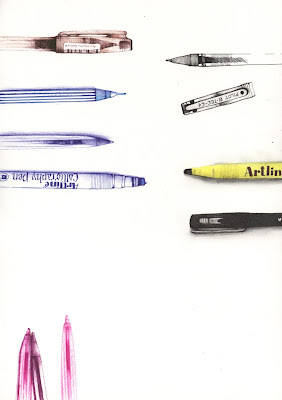 Some of may favourite pens to be precise. That's all they were ever meant to be, but sometimes I cannot leave a page be. I originally drew the pens to decorate the pages of my latest little zine. But then it grew and grew and grew. 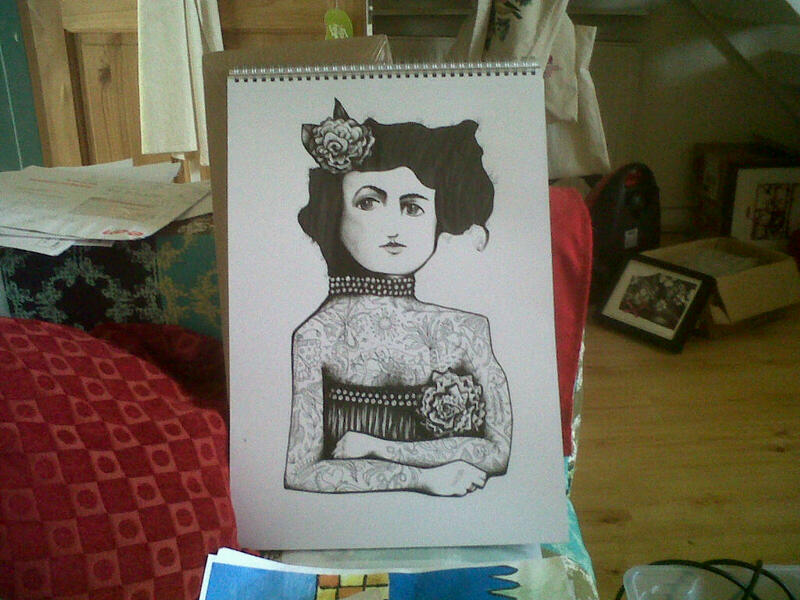 You can buy the original drawing HERE. 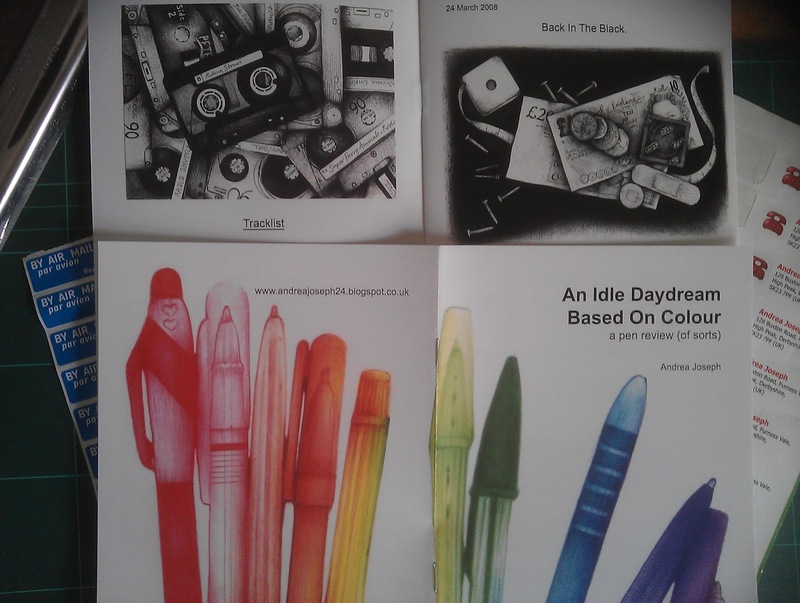 Or if your budget does not stretch to an original (I know mine doesn't), then you get buy the zine HERE. So, Tim here, Andrea's friend, stepping in as her technology has failed her yet again. Obviously there must be a reason for the need to post something, anything, this thing. The reason is that Andrea is about to release a, wait for it, brand NEW zine! Hooray!, I hear you cry. So here is a first glimpse of 'An Idle Daydream Based On Colour' a pen review (of sorts); as it is titled. 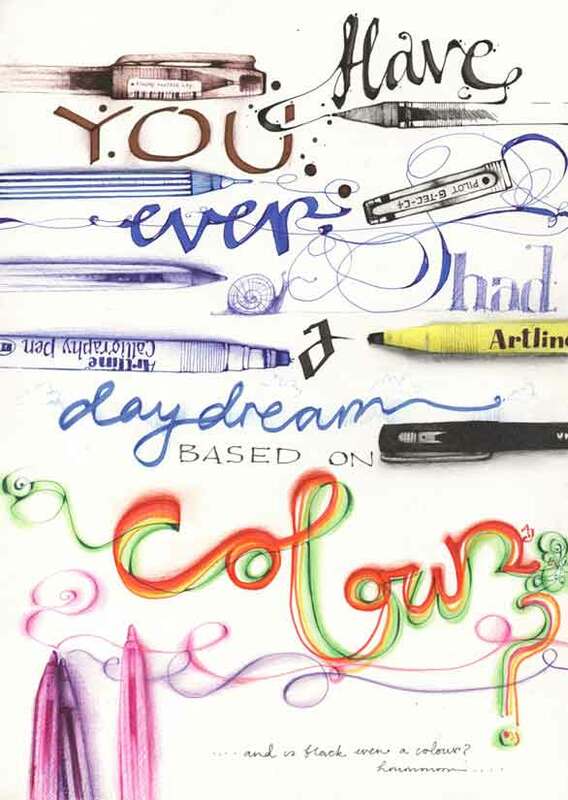 This Daydream is all about pens used in making some of Andrea's iconic images. 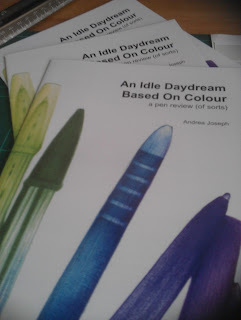 So if you like pens, or like the work of Andrea, or both, or are just interested in the tools of an artist then read on. The zine is A5 size, professionally printed on a lovely 170gsm silk paper, 12 pages and includes not only images from this very worldwide blog, not only a story about the pictures' creation but also a new illustrated pen on most of the pages, representing the pen used (sometimes) in that pictures', er, creation. 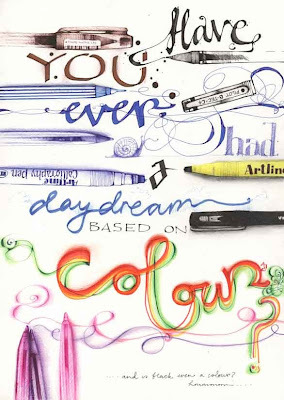 I have one of the 'Daydream's here and it is smoothly gorgeous. They will available worldwide from the Etsy shop SOON. Possibly by the time this is read by you, you lovely followers of the wonderful work of Miss J. Thank you letting me bother you, and do check out the new zine, I think you will like it. Oh folks, my technology issues continue. But, as bored and frustrated as I am with it all, I'm not letting it get me down. No. 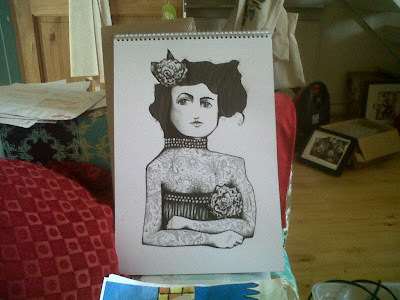 It's giving me more time to draw, create and make some new products ('citing!). Still haven't got around to cleaning though, as you can see.